The Namibian Government is set to sign a revised agreement with regard to regulations governing the allocation of rights to use and exploit the water flowing down the Orange River from where it rises in the Drakensberg mountain range in Lesotho to where it flows into the Atlantic Ocean. 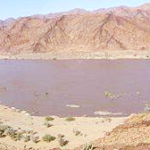 Considering the generally dry climatic conditions characterizing the sub-continent, fresh water resources such as the Orange River plays a great economic role for the people of Namibia. The Secretary to Cabinet George Simataa stated that the sharing of the Orange River will be revised due to policy and institutional issues amongst the four countries – Namibia, Botswana, Lesotho and South Africa – that share the river’s water. Speaking at a media briefing today on cabinet decisions taken by government, Simataa said that Cabinet has authorized the Minister of Agriculture, Water and Forestry to sign on behalf of Namibia, the Revised Orange-Senqu Watercourse Commission (ORAESECOM) Agreement, and subsequently table the agreement in Parliament for ratification. He added that the commission was established on 3 November in the year 2000 in Windhoek. He added that the agreement regulates the usage of water from the mighty Orange River, as it passes through all four countries. Simataa explained that the agreement has been in force however institutional and policy issues have necessitated the review of it. He stated that although the agreement has been in force, Ministers responsible for Water Affairs were not considered on the hierarchy of decision making. Simataa further discussed the perpetual drought situation in the country and stated that drought resilient measures should be implemented from a community, government and national level. He added that Cabinet has directed the Ministry of Agriculture, Water and Forestry, in collaboration with Regional Councils, to monitor the situation and respond according through identifying food insecure people and request food assistance from government. Simataa said government will repair and install boreholes and where possible provide water tanker services to the affected areas. He also noted that government has directed the Ministry of Agriculture to advise farmers in areas affected by poor grazing to de-stock and cull while livestock is in good condition. Cabinet further directed the Ministry to ensure timely and sufficient allocation of production inputs and expedite the repair of government tractors in order to enhance productivity in the crop growing regions during the cropping season.